My dad used to always harp on at me, “Don’t count your chickens before they hatch.” It was one of those childhood lessons brought out if I would say something like, “I’m going to win the colouring-in comp!” etc. The chicken lesson was reiterated in a much-loved Enid Blyton book later (The Children of Willow Farm, anyone?) but even that didn’t make me more guarded. I have always had a bad tendency to get overexcited and talk about things and projects that haven't necessarily happened yet, or might never happen. Even with this blog. “I’m going to write a blog! I want to make it part of my job,” I told bemused friends who asked me how work was going, months and months before I ever clicked “Publish” on a post. Anyway recently I have been exceptionally good at NOT counting my chickens before they hatched and not telling the world something (well except all of my closest friends) and now it is definitely happening. And NO, before you ask, I’m not pregnant (that’s just pasta). I’m going to be writing a newspaper column! Starting tomorrow, there will be a House Nerd column in The West Australian New Homes magazine each week. With my name on it and a little photo of me. I know my name is in the paper on stories every weekend because that is my job as a journo, but there is something exciting about a column. I have always wanted to write a proper serious newspaper column, ever since I started reading Danny Katz’s column when I was 13 and got a nerd crush on him even though he kept insinuating he was an ugly hairy guy. But the ugly hairy guy made me LAFF. That column he wrote once where he was talking about trying to bake with his children and he accidentally stepped on a cookie cutter and left little duck-shaped pools of blood through the house? I could burst out laughing at the mere THOUGHT of that column, years later. 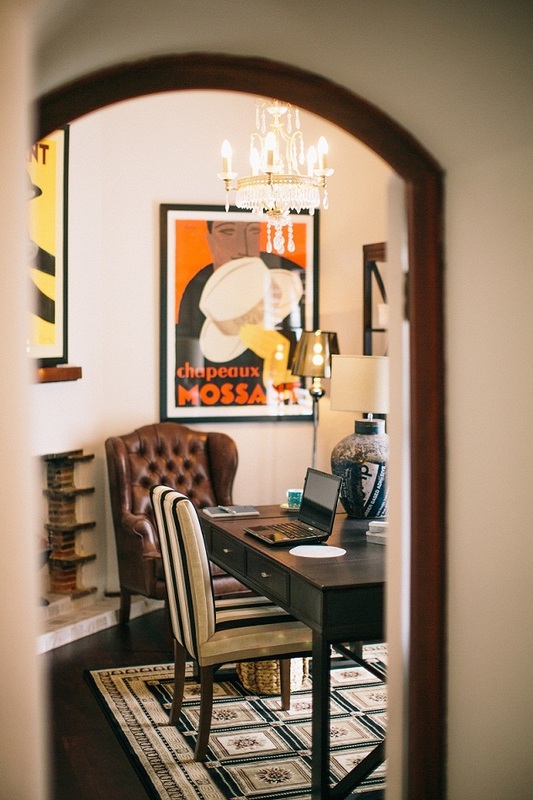 The home office of Vanessa of Villa Kula, home tour featured on House Nerd here. 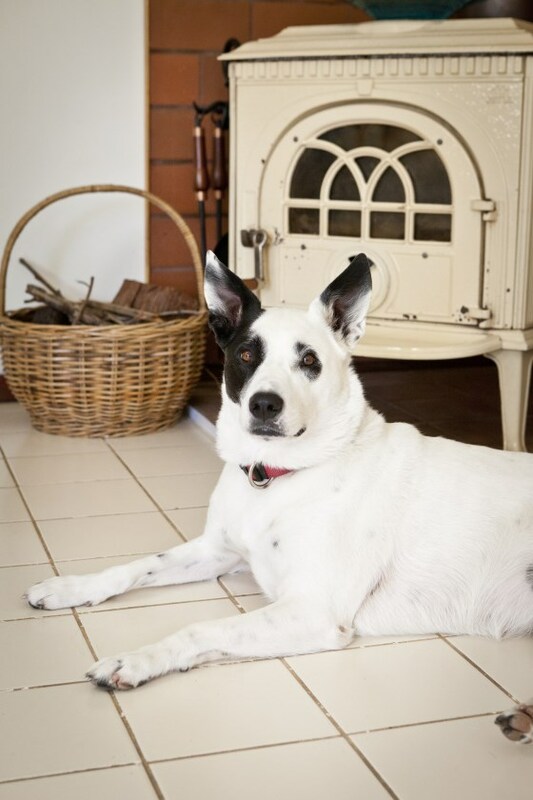 Photography by Meghan Plowman of The Orchard. The West offered to send a photographer to get a headshot of me, but I just asked my sister Simone Anderson to take it. I knew I could relentlessly keep making her take a photo until we got a really good one. It is probably too good as I actually don’t look that nice and neat in real life, ever. But I knew that the photo had better be a nice one because it was probably going to stick with me for a long time. I know from my job in journalism and dealing with real estate agents that once you have a photo taken for a professional purpose, that photo stays with you for many, many years. Seriously though, the number of real estate agents I meet who are using photos ten or fifteen years old… should change them. I remember years and years ago going to review this house in Floreat. The ginormous For Sale sign outside the front of the house showed a handsome man with thick, Ken doll hair, bright blue eyes and a set of blinding white teeth, probably in his late 30s or early 40s. I waited by the sign for the hottie to arrive, and after five minutes a fancy car pulled up in the driveway and an old balding guy crept out gingerly and started to inch up the driveway. “No, I’m Jon, the real estate agent,” he said, shaking my hand with a hand that felt dry as parchment, his wispy hair blowing in the wind as he looked at me in puzzlement. “OHH…” I said, baffled, and then, without really realising what I was doing, because I am an idiot and have NO presence of mind, I looked slowly at the picture of the young good looking man on the real estate sign, and then back at the agent’s near-bald head, and then back at the sign. Dammit, nerds, why do I do stuff like that? The agent sort of looked at me like I was the biggest dummy on the planet. Yes I am socially retarded, BUT COME ON. Why was he still using a photo of himself from 1944? Not cool, old man. There should be a professional picture rule, like, four years and you have to change it. Unimpressed. Photo by Heather Robbins of Red Images Fine Photography. Posted: Friday, June 27, 2014 . WOW! So many exciting things on the blog! Congrats, I can't wait to read it. Thanks Jade :) my dad is the same as yours.... insists on reading the paper first! He gets upset when I muss up his sections. Fantastic news Maya, Congratulations and well deserved. Can't wait to read your first column tomorrow. Congrats Maya it is all happening for you right now. All that hard work and determination and cheeky attitude is getting you places girl! Cant wait to read your column, you are such an incredible writer :) P.S. Imagine if it was a blind date then you would be even more annoyed, thats false advertising dude! I know! "Uhhhhm you don't look like your RSVP photo, you are 100." And thank you... it does finally feel like all the hard blogging yards are starting to pay off :) Still a lot of hard work to go until I'm where I want to be, but feeling very thankful! Very good news Maya. We don't buy the paper any more as everything is online these days, but will make an exception tomorrow! Maya I am so pleased for you. That is so exciting. We always buy the Saturday West but not the daily versions so I'll be eager to have a read. I feel so excited for you. Congratulations! Congratulations Maya. I love reading your blog and have found some great ideas and interior designers through it. You have a wonderful style and I laugh at least once every time. Looking forward to your column. That is awesome, well done Maya!!! Great column in last Sat's west. A really enjoyable read. 100%agree with you on Danny Katz - just love him! My mum still has The Children of Willow Farm on her bookshelf at home. You know that was the sequel to The Children of Cherry Tree Farm (another brilliant read)? Thank you Sarge! I still love Danny Katz.... and yes, the Children of Cherry Tree Farm! I remember being so excited as a kid to find there was actually a prequel... and then later, discovering that there was a sequel, More Adventures on Willow Farm! I read those books so much, over and over that the pages started to fall out. Love Enid Blyton!